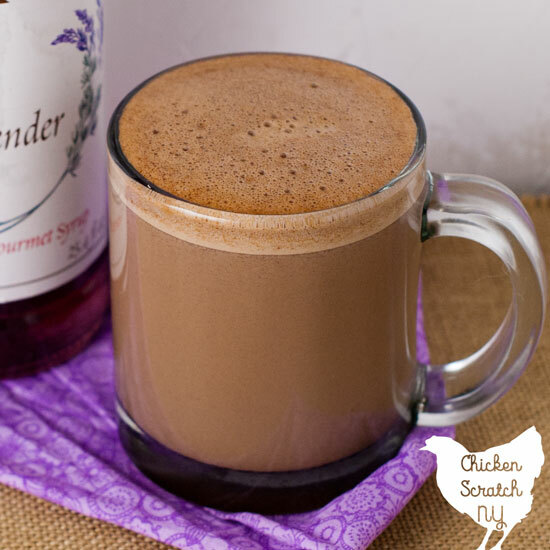 Hot chocolate is the perfect treat for a cold day and this variation with a hit of lavender is the best way I’ve found to end that day. Lavender hot chocolate might sound a bit crazy but I promise the sweet floral flavor of the lavender is the perfect complement to a a dark hot chocolate. This recipe is for an easy stove top hot chocolate, it’s scaled for one mug but you can double or triple it without any serious math. I used 60% Cacao chips from Aldi’s, I’m a dark chocolate girl and they have an amazing flavor. You can also use chopped bakers chocolate. 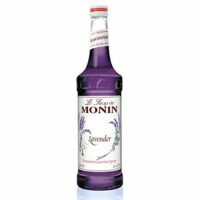 The lavender flavor comes from lavender syrup made by Monin, there are other brands available but I’m a Monin fan from way back. Last summer I was desperate to make my own Butter Pecan coffee after Dunkin got me addicted and I went a little crazy on the Monin site. I bought bottles of Butter Pecan, Lavender, Pistachio and Coconut syrup. The Butter Pecan has found it’s way into my weekend coffee, the pistachio makes an amazing soda, the coconut is the star of my Spiked Almond Joy Hot Chocolate (you can get that recipe and more boozy cocktails on my second site Tipsy Chickens) and of course the lavender ended up here. You do have to buy the pumps separately but they are worth ten times the price you pay. 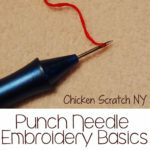 They keep everything clean and they measure out 1/4 ounce per pump making recipes a breeze. I like to use a small sauce pan for this kind of recipe, the one that only gets used to heat up the lids when I’m canning. It doesn’t take long to heat the milk so keep an eye on it so it doesn’t scorch. Add a pinch of salt to bring out the chocolate flavor. Burnt milk isn’t part of the flavor we’re going for here! One you see bubbles forming around the edges it’s time to turn off the heat and whisk in the chocolate and Lavender syrup. I have a secret weapon in my kitchen for hot drinks of all kinds, from lavender hot chocolate to Spiked Pumpkin Steamers. 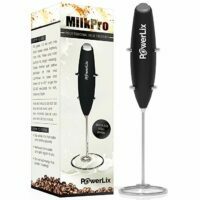 It’s a small, hand held frother. Mine runs on a single battery and it even came with it’s very own stand, I keep it on the window sill in the kitchen next to the coffee maker. It’s basically a tiny whisk, it adds lots of volume to your drinks by adding in air. 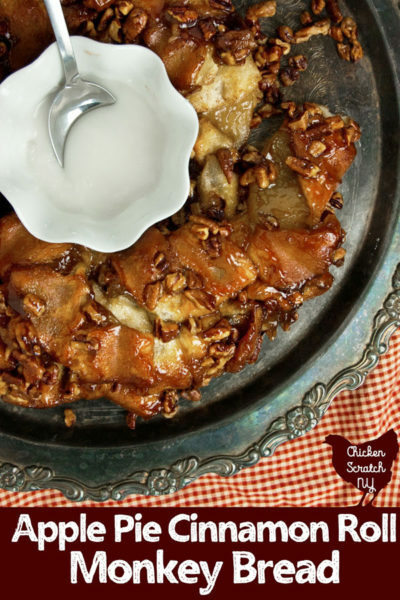 It’s a great way to get the rich, heavy cream texture without adding an extra 100+ calories. Milk is very good at holding on to bubbles but it will deflate over time. I want to warn you that your drink is going to double in size or more. Make sure you’ve got lots of extra room or you’ll have a mess on your hands. I like to use quart sized mason jars but this time I just did my frothing in the sauce pan I used for the lavender hot chocolate. 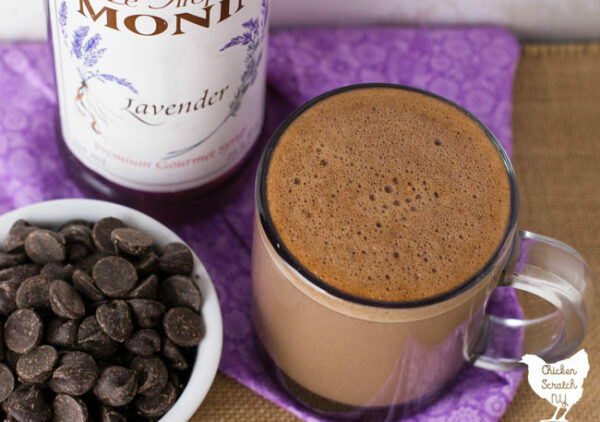 If you aren’t feeling the chocolate a Lavender steamer is great for a late night snack. Heat up a cup of milk in the microwave in a quart sized mason jar, add the syrup and froth it up. 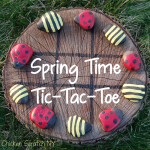 The floral scent combined with the warm milk will have you drifting off to sleep in no time. I love all things lavender! 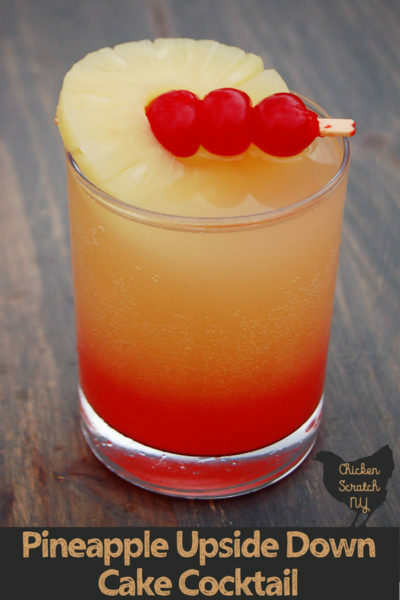 Stumbling upon this recipe made my day. I never thought to make lavender hot chocolate. 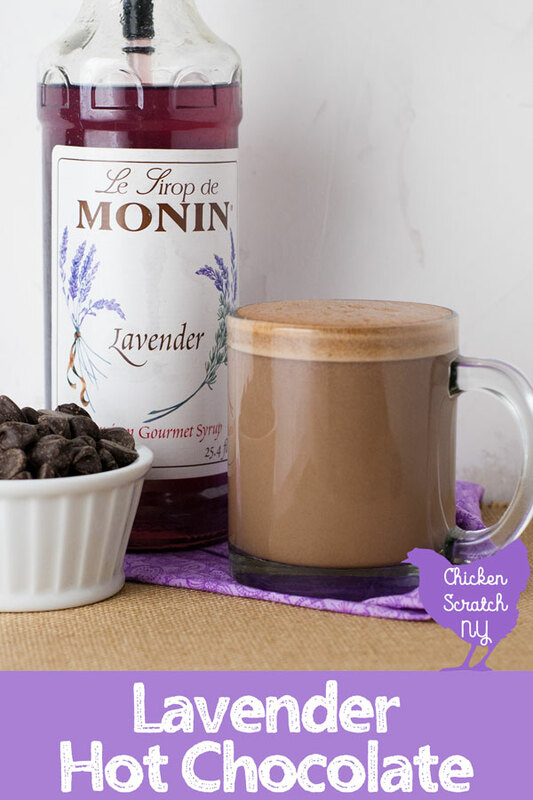 Two of my favorite things, lavender and chocolate together makes my heart happy!